A single storey temple built on a solid stone plinth, having gabled roof. The ‘gabled roofed’ temples are structurally and architecturally the simplest temple types. Such temples abound in Chamba district. 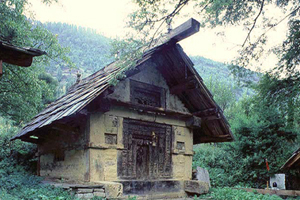 Even the famous Lakshna Devi temple at Bharmaur and Chamunda temple at Devikothi (Chamba) are gable- roofed structures. In Kullu district, such temple-types are few and only confined to the Beas Valley. Among such temples, the Docha-Mocha temple at Gajan, near Nagar, is distinct for its life-size wooden images. The other better known examples of this type are the Sandhya-Gyatri temple at Jagatsukh and Gautam Rishi temple at Goshal.